Posted by While in Vancouver for my girlfriend's wedding, we met up with some friends for dinner to relax and try out some Japanese fare which Vancouver is known for. 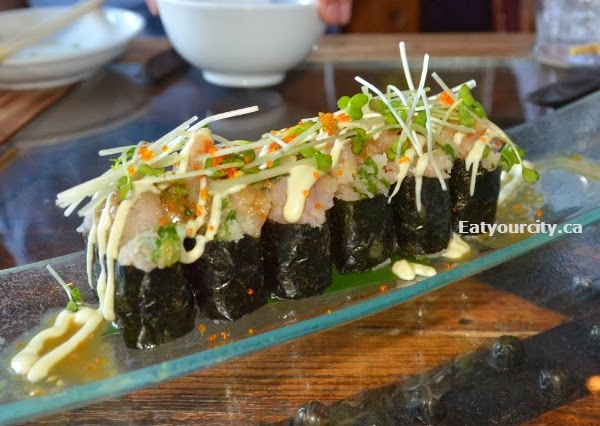 Kinyo Izakaya serves Japanese style tapas, sushi and other goodies with a fusion twist... incorporating Chinese and Korean elements in. After scoring some street parking outside, we were glad we made reservations has this place was packed and hopping. Onto the food! 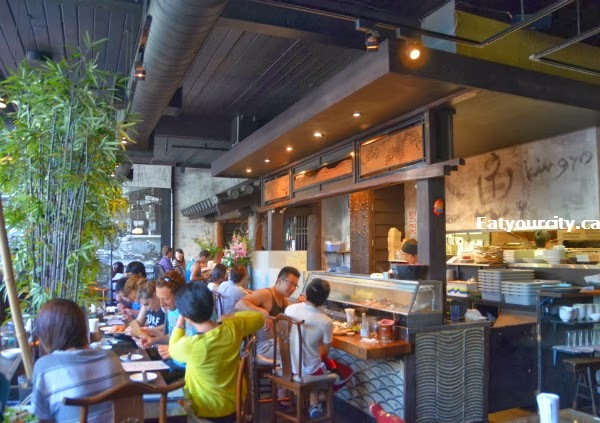 The space reminds me of a cheerful bar smushed into a greenhouse as there's plenty of natural light streaming through the large windows that face the street, and the bamboo trees that serves as a partition is probably why I thought of greenhouse. Its a cozy and welcoming atmosphere. 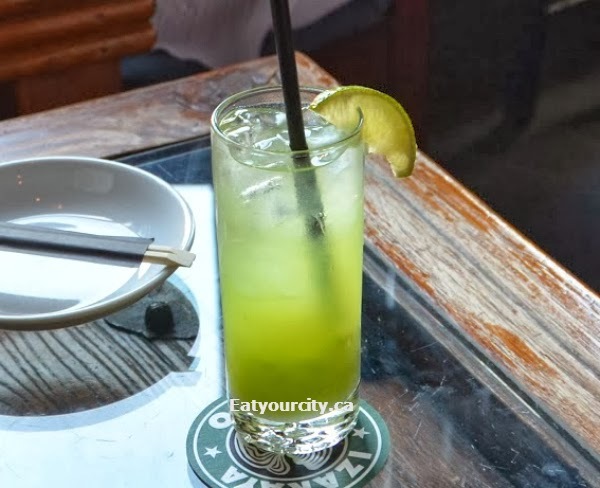 We start off with a round of bevvies... the Suika Aloe with watermelon liqueur, vodka, aloe vera juice and a lime slice is light and refreshing with a cool verdant green hue. The Fresh melon white wine sangria with fresh melon, calpico, melon liqueur, white wine, soda and lime is also light and refreshing with sweetness from the fresh pureed melon. The Pineapple Mojito (choice of fresh squeeze orange or grape fruit - I chose grapefruit) was tart, devoid of mint, and could have used more pineapple since pineapple is part of its name hahahaha! The Fresh Moscow Mule with vodka and homemade ginger ale needed quite a bit more ginger in their ginger ale as it was quite a bland drink. Since it was a group of 6, we decided just to randomly order whatever we felt like and share it family style so we could try a larger swathe of the menu. We started off with a Fresh Sashimi Salad. 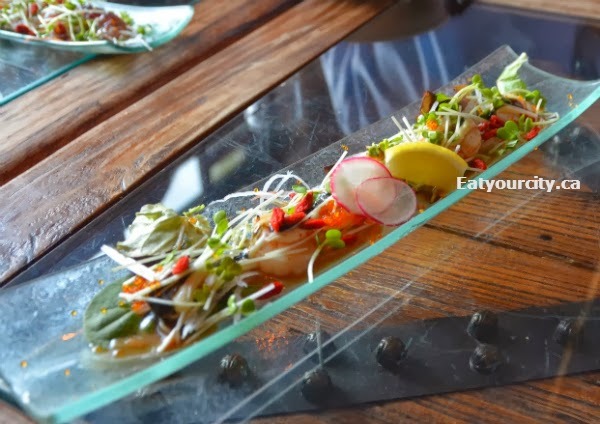 The three types of sashimi are changed daily... ours was tuna, scallop and salmon sashimi on a bed of organic greens dressed with a soy sauce based vinaigrette and drizzled with garlic oil.. The sashimi was fresh, and we wished for the dish to be larger as we made it disappear pretty fast! Next up was the Stone Grilled Beef Tongue. In this case, you're paying more to play with your food than the portion size. Salt and peppered super thin slices of beef tongue topped with green onions is set beside a smoking hot.. well chunk of smooth rock and you pop the meat on top briefly, flip to cook again and serve with yuku red pepper paste. Its simple and tasty! It was simple and delicious with the light sear adding a gentle grilled flavor to the smooth mackerel. The Aonori Calamari was a hit which disappeared like magic. Bite tender deep fried squid is lightly tossed with aonori (the little green flecks of dried seaweed) and served with an interesting Shiso herb salsa and homemade tartar sauce. The shiso herb added in a nice refreshing zing to the salsa. The My Ebi Mayo was a few deep fried crispy tempura battered shrimp sitting in a big pillow of spicy chili mayo sauce, and topped with chili strings and a smattering of paprika. Simple and deliciously spicy. 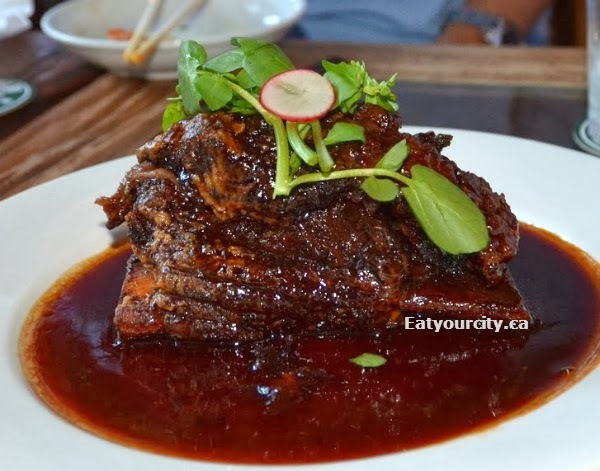 The Chinese Sweetened Balsamic Sauteed Dynamic Jumbo Beef Rib was topped with a watercress garnish and sitting in a pool of its juices it was braised with. It was essentially a beef rib slow cooked in a soy sauce and balsamic vinegar sauce, rendering it quite tender and moist, and the sauce reduced and sticky-sweet. The Stone Grilled Kakuni BiBimBap had a small piece of tender fall apart stewed pork belly, Korean style pickles, green onions, and toasted nori in a hot stone bowl filled with rice. I was sad it didn't come with a raw egg yolk to sauce and tie things together, but it was a tasty dish none the less. We were planning on heading to Bella Gelateria afterwards for gelato, so we shared a Tiramisu to save some tummy space. The tiramisu wasn't too memorable as it completely lacked espresso and marscapone flavor... plus it lacked the presentation that was recurrent throughout all the other dishes. With the bill, they had complimentary frozen grape skewers, which we loved. It was a nice whimsical touch to the end of the meal. 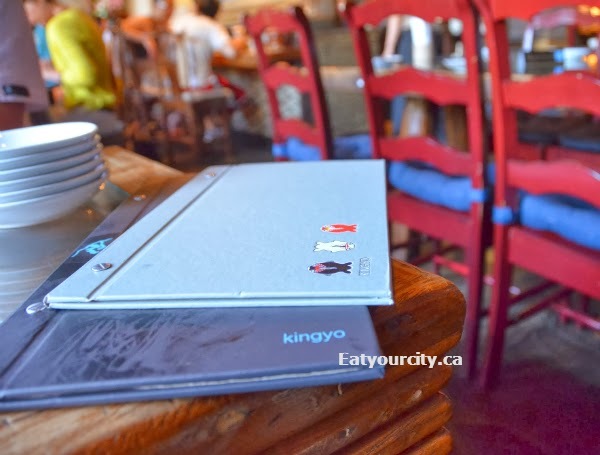 Overall, a good place to go for a variety of fusion inspired tapas.